100% Brand New and High Quality. Made from durable material. This Item could help you install the cage stably and efficiently, and save you much time and labor. 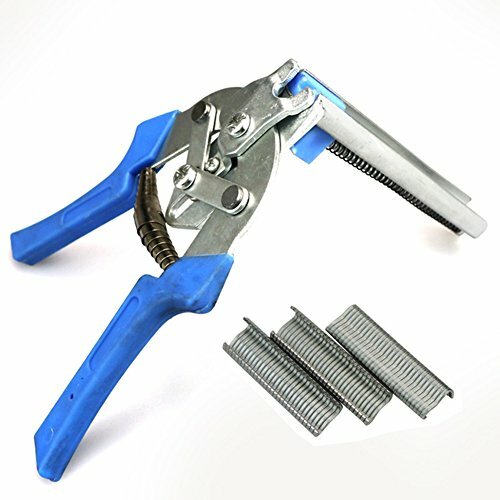 The pliers are used to install fowl cages such as chicken cages,pigeon cages,rabbit cages,pet cages etc. Simple to Operate, High Performing, and Cost-effective. Package Includes: 1 Cage Plier & 600 Nails. 1.To avoid any shipping delay, please complete payment as soon as possible. so we can send you the item in time. 2.If you have any problems during paying or if you don't want it any more, please feel free to let us know. We can help you to resolve the problems or cancel our transaction. Best regards! 3.All items are shipped from China, AU, USA directly, it depends buyers countries and current stock situation. We ship worldwide. 1. We accept return for exchange or refund. 2. When you received your package, promptly check the items to make sure the items are intact. Email us with pictures if defective items was found, we will resolve the problem ASAP. 3. Please kindly contact us before return the item, we accept return for refund or exchange, but shipping cost is non-refundable. If you have any questions about this product by Lucky Farm, contact us by completing and submitting the form below. If you are looking for a specif part number, please include it with your message.